at the Tervetuloa Restaurant in Alsancak. I have bought two tickets for us according to the information in the letter of invitation. It promises to be again a lovely evening. 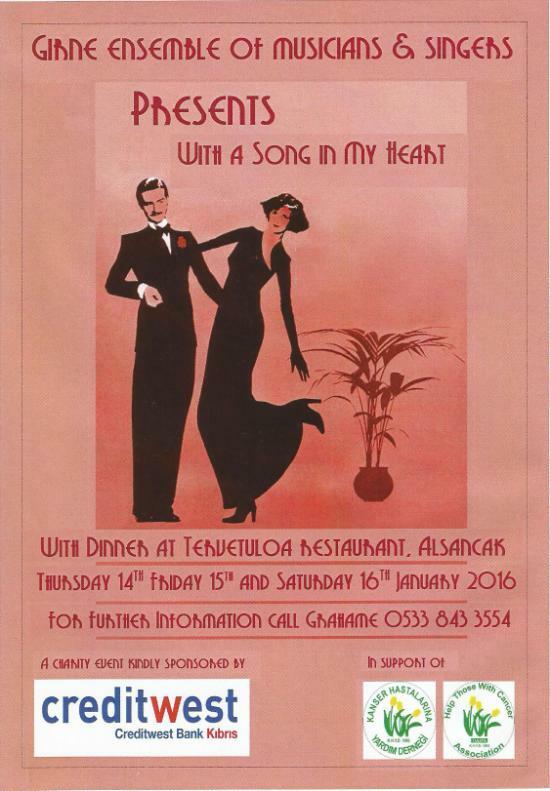 We are pleased to advise that our next show – “With a Song in My Heart” – will be performed 14th, 15th and 16th January 2016 (Thursday through to Saturday) at Tervetuloa Restaurant in Alsancak. The evening will commence with a 3 course dinner followed by entertainment. The price will be 60TL per person. Again proceeds from this show will be going to Tulips. 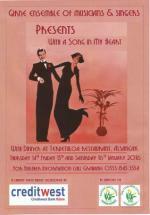 Your invitation is to join GEMS at a 1920’s Dinner Party, given by a Society Hostess who, together with her family and friends, will entertain the guests to an evening of memorable songs from the Roaring 20’s. Make it an opportunity to dress up, either in costume from the 20’s or Evening Dress, the choice is yours. There will be small prizes for the best dressed man and the best dressed lady. Before we start offering the seats to the Public we would like to give you an early opportunity to make a reservation. As this show will have a dinner party theme tables will be for 8 or 10 people, so you are invited to reserve a table for your family/friends or join a table with others, remember strangers are just friends you haven’t met yet! 1. Please respond to this email to reserve your ticket(s) or reserve a table and indicate which date you would prefer. 2. On receipt of your email you will be sent the menu selection and payment arrangement information. 3. When making payment you will be able to choose your table/seat from the table plan available and you will be asked for your menu choices, these will be marked on your ticket. So the earlier you pay the better choice of seats you will have. I would also like to thank creditwest bank and Compass Cyprus Chartered Surveyors for supporting our evenings.